Hi Folks. Here we are in September after what can only be described as a pretty damp summer. We had another wonderfully peaceful Meditation retreat in June. Big thanks to everyone who came and to Dene Donaldson for his guidance. Looking ahead we have our Bee Aware event at Carmichael. See the lovely poster below. This is FREE too so no excuse not to pay us a visit. Lots to see and do. In October we will see the return of the amazing UK Playshop. 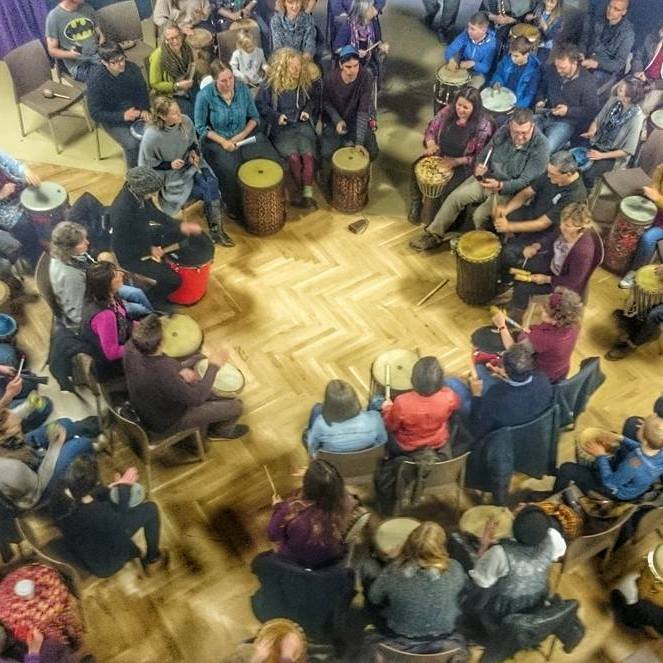 This year over 60 people will join us for an extended drum circle facilitation training program at Wiston Lodge from 16 different countries. How amazing is that? As always we will complete our training with a fantastic FREE community family friendly drum circle as part of the Biggar Little Festival. This will be followed by the inaugural TTT (Train The Trainer) program. Our very own Paul John Dear will be one of the 12 global trainers stepping into the shoes, coat and hat of Arthur Hull, to continue his inspiring work of building community through rhythm. We are already looking ahead to 2018. There will be more meditation retreats, more drum circle facilitation and the return of Music Medicine Training with the fabulous Christine Stevens too!! In and among we hope to offer smaller events focusing on local musical talent, ecology ( specially our friends the Bees) and who knows…a surprise or two no doubt. Keep posted with all we are up to by Subscribing to our mailing list. See you at an event soon.